This Hop-On Hop-Off Pass includes narration from guides and combines four diverse tours on one incredible value ticket! 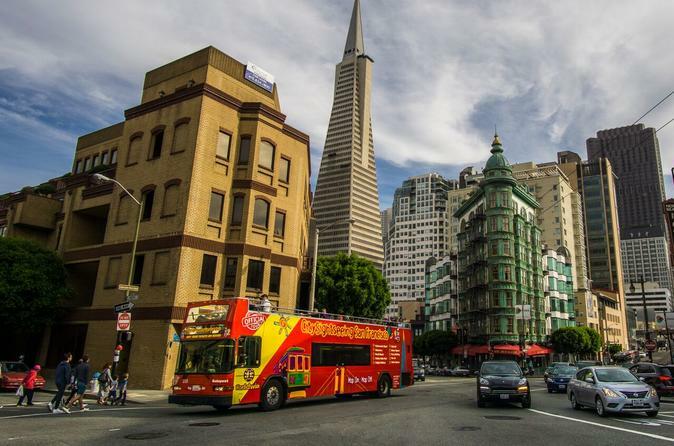 It gives you and your small group the opportunity to explore Downtown San Francisco, the Golden Gate Bridge, Golden Gate Park, and Sausalito with unlimited hop-on hop-off use for 48 hours. In the evening, you can also enjoy the beautiful views of the city during the San Francisco Night Tour. See the most iconic sites of San Francisco – the Golden Gate Bridge, Golden Gate Park, Union Square, Civic Center, Fisherman’s Wharf, and a lot more! The tour departs from Fisherman’s Wharf, taking you along the Embarcadero, Barbary Coast, the Ferry Building, Financial District, and right into San Francisco’s central shopping area at Union Square, before heading to the iconic Golden Gate Bridge. At South Vista Point you can walk across the 1.7 mile span of the bridge, or you can explore the Golden Gate Bridge Welcome Center and the Presidio. The tour continues into Golden Gate Park, one of the world’s largest man-made havens and one of the most popular places to see in San Francisco. With several stops throughout the park, you can visit the California Academy of Sciences, the De Young Museum, the Japanese Tea Garden, or the Botanical Gardens. Continuing the tour through Haight Ashbury, you will experience the so called “Hippie District”, before we head into the Civic Center area with many architectural landmarks, such as impressive City Hall, the Opera House and Symphony Hall. Passing Union Square, the tour continues into Chinatown and North Beach with its world-famous crooked Lombard Street, before returning to Fisherman’s Wharf, stopping at various waterfront locations, including Pier 39 where you can see the popular sea lions and explore the restaurants, shopping and many attractions for more fun in San Francisco. Take this tour from South Vista Point to have the best views of the Golden Gate Bridge while driving across the bridge to North Vista Point. From there you have breathtaking views of the San Francisco Bay (weather permitting), and on a nice day you can see the San Francisco skyline, Alcatraz Island and the Bay Bridge, making it a great photo stop for every visitor. The tour continues into Marin County and stops in charming Sausalito where you can hop off the bus, stroll around, shop, dine, visit various art galleries and enjoy a relaxing lunch by the waterfront. See Golden Gate Park and the Pacific Ocean! This one hour tour takes you through one of the largest urban parks in the world to the San Francisco Zoo and to stunning Ocean Beach. Some of the tour highlights include: California Academy of Sciences, the De Young Museum, Japanese Tea Gardens, the Conservatory of Flowers, Lincoln Park, Ocean Beach, the historic ruins of the Sutro Baths, Lands End hiking trails, the Cliff House, and San Francisco Zoo. This live narrated 90 minute tour of San Francisco shows you the most vibrant neighborhoods of the city! Enjoy spectacular views from the top of an open top Double Decker bus. The tour includes two brief walking tours around Nob Hill and the Embarcadero for even more photo opportunities.